Welcome to a special Learning Without Tears “how-to” blog post. Today, we’re giving you our top tips for planning your own handwriting camp. Summer camps can be a fun and exciting way for teachers and OTs to make extra money while doing something rewarding during summer break. Handwriting-themed summer camps provide a fun-filled, hands-on environment to boost students’ handwriting and literacy skills over the summer—all while having a fun time with multisensory, play-based activities. 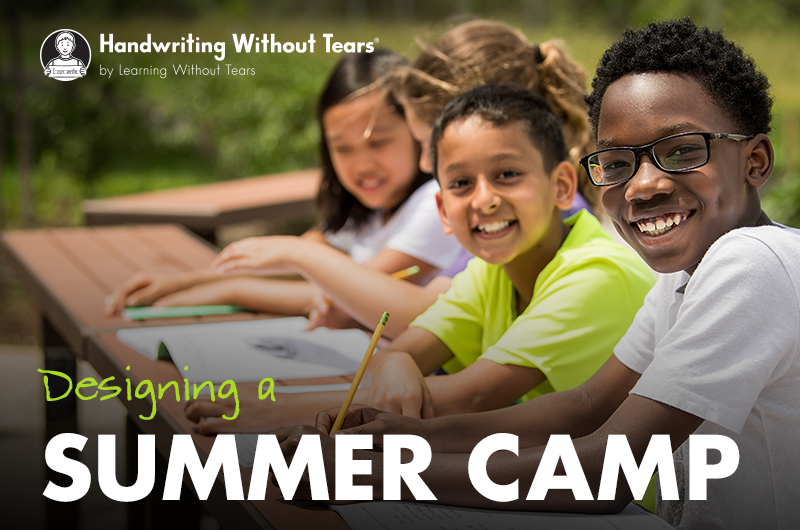 For a crash course on how to plan a handwriting summer camp, view our new webinar Designing a Summer Camp. This webinar offers easy ways to create a fun adventure for both you and your campers! 1. Create brochures with a description of your camp, rates, location, and other pertinent details to distribute to spread word about your camp. 2. Start marketing your camp during February or March. This is when parents usually start look at what they are going to do for the summer. 3. On the first day of camp, use The Screener of Handwriting Proficiency to evaluate your students' developmental level. ­4. Instead of trying to cram learning the entire alphabet into one summer camp session, try providing a student workbook for each child. Then, take a couple of letters from each group of the developmental teaching order. As you are working on a particular group, you can give the other letters for homework. 5. To wind down your camp for the day, try wrap-up activities including sitting in a circle and discussing the best part of the day or sitting in a circle and participating in a song. Any activities that will help children reflect about their day are beneficial. Simple yoga stretches are also a good activity to wrap up a session!